Here's a thing you might not know about me. I am a Sudoku addict. No, really. It's a bad, bad thing. The reason that you probably don't know this about me is that I don't allow myself to muck about with it very often. I can't. It's kinda like the Lay's potato chip thing. I can't do just one. If I were to pick up the Sudoku book, say....over breakfast for instance, I might not look up until the wee hours of the next morning. Ask me how I know. So, since I have a job to do, cats to feed, a husband to hang out with, stuff to knit, and a house to renovate, I don't do nearly as much Sudoku as one might expect of a self-confessed Sudoku addict. You might be asking yourself what, if any, relevance this might possibly have to a 'Knitting' post on what claims to be (and again, I realize that I use this term a bit loosely) a knitting blog? Well, do you happen to remember this post about the brilliant idea over at Pixelated Knits? Go ahead, refresh your memory. I'll wait. Back now? Good. Now let's talk about how I set about interpreting this little bit of insanity, step by step, to 'design' an afghan for our living room based on two Sudoku puzzles, one to generate the stitches to be used, and another to generate the colors. 1. First commit oneself to as much absolute randomness as possible. 2. Visit the stash. Hmmmmmm.......yes indeed......THIS is the perfect thing, and there's lots of it. Perfect. Assign each of the colors a value 1-9. 3. Look through one's library for some stitch dictionaries. Pull out as many as look likely. How many did you pull out? 2? Flip a coin. 4? There are some of you out there who know exactly what to use for that, aren't there? Go ahead, raise your hands. We're gamer friendly here at Chez Obsession. 6? A regular die will do. You get the picture. In my example, the winner was 250 Creative Stitches: Harmony Vol. 4. 4. Using a handy-dandy online random number generator, create several lists of 250 random numbers between 1 and 250 ('cuz, the book has 250 stitches, see?). I created 6 different lists, and then rolled a regular 6-sided die to pick which list to use, but that's really starting to walk the fine line between commitment and insanity, and I know it. I'm also aware that I didn't need 250 numbers, but, um.......all right, so I'm crazy. 5. Next, call a very patient friend and ask them, without explaining why, to pick a number between 1 and 250 (see? more insanely unnecessary randomization.). If they pick the number 50, for instance, go to your list of numbers and find out what the 50th number is. If that number happens to be....say...125 ('cuz, you know, random), then the 125th stitch in the stitch dictionary is your first of the 9 stitches you will need for your Sudoku Afghan. 6. Do this 8 more times. It's your choice if you want to tap out just one friend or nine for the number choices, only you know how patient your friends are with your lunatic ideas. 7. 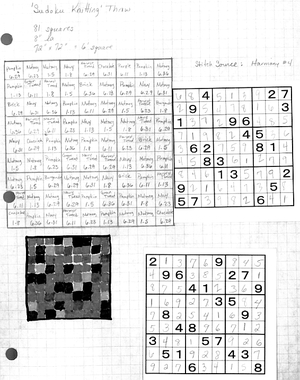 Now, and only now, pick two separate Sudoku puzzles, but before you work them assign one of them to generate the colors and the other to generate the stitches. I chose to do this before working the puzzles because....well.....because it seemed more random. What? Leave me alone. I haven't cast on yet, but I will. Soon. Winter's a-comin', and my house is old and drafty.